A global (multi-CCD and multi-dither) astrometric calibration is calculated per filter per tile. SCAMP (Bertin 2006, ASP Conf. Series 351, 112) is used for this purpose, with a polynomial degree of 2 over the whole mosaic. The (unfiltered) 2MASS-PSC (Skrutskie et al. 2006, AJ, 131, 1163) is used as astrometric reference catalog. A more detailed description of the astrometric pipeline is in MF13. SWARP is used to resample all exposures in a tile to the same pixel grid, with a pixel size of 0.2 arcseconds. After background subtraction the exposures are coadded using a weighted mean stacking procedure. The accuracy of the absolute astrometry ("KiDS vs 2MASS") is uniform over a coadd, with typical 2-dimensional RMS of 0.31 arcsec in g, r, and i, and 0.25 arcsec in u. The lower RMS in u-band is most likely due to the fact that in this band on average brighter 2MASS sources are selected as reference sources. Absolute astrometric accuracy in KiDS-ESO-DR1, based on the RMS of the 2-dim. positional residual of KiDS – 2MASS source pairings across dithers. Top: across a single KiDS coadd. 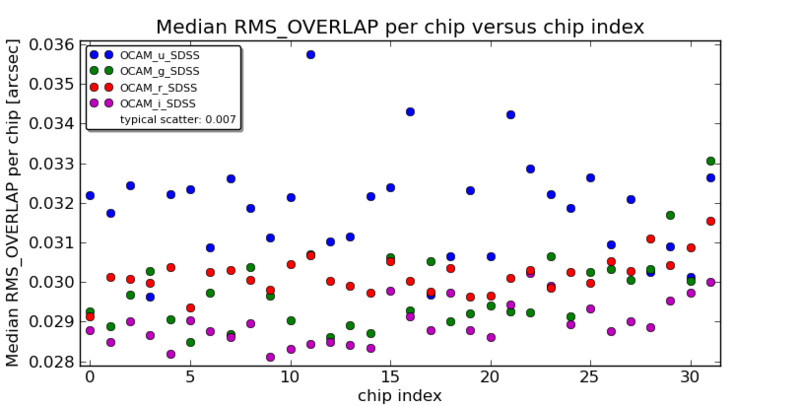 Plotted is the median of the RMS ensemble of all 50 KiDS tiles per CCD (chip) for u (blue), g (green), r (red) and i (magenta). The typical standard deviation in this RMS ensemble is 0.003 arcsec and is similar for all CCDs and filters. Bottom: for all coadds vs. RA. Plotted is the median RMS for each coadd with colors indicating the filter: u (blue), g (green), r (red) and i (magenta). The accuracy of the relative astrometry ("KiDS vs KiDS") is also uniform across a single coadd. This is indicated by the 2-dimensional positional residuals of sources across its input dithers. The residuals have a RMS of ~0.029 arcsec for g, r and i and ~0.032 arcsec for u. The slightly larger RMS in u-band is due to the smaller number of available reference sources. 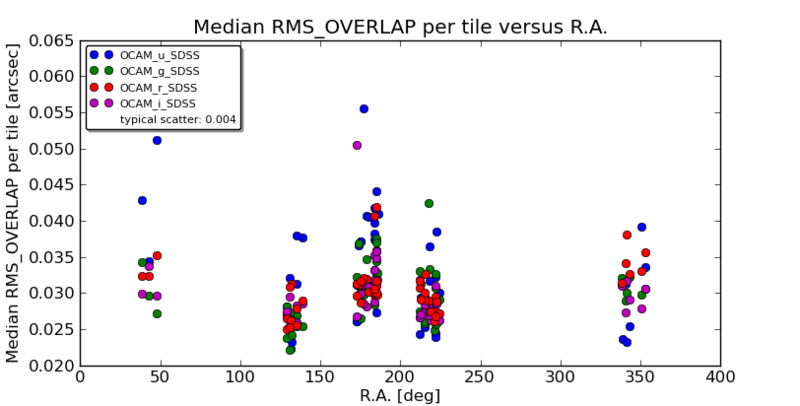 Overall, the RMS is ~0.030 arcsec for g, r and i. For u the scatter is larger with maximum RMS ~0.055 arcsec. 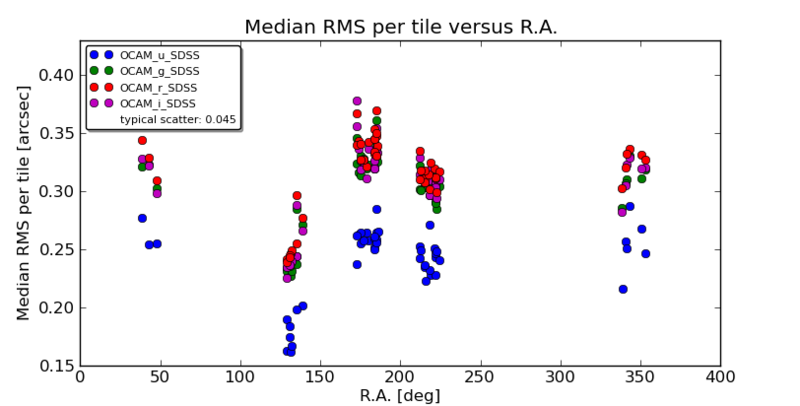 Relative astrometric accuracy in KiDS-ESO-DR1, based on the RMS of the 2-dim. positional residual of source pairings across dithers. Top: across a single KiDS coadd. Plotted is the median of the RMS ensemble of all 50 KiDS tiles per CCD (chip) for u (blue), g (green), r (red) and i (magenta). 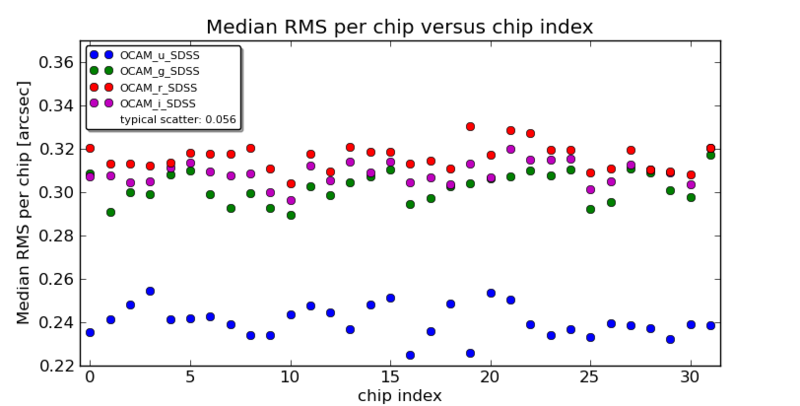 The typical standard deviation in this RMS ensemble is 0.007 arcsec and is similar for all CCDs and filters. Bottom: for all coadds vs. RA. Plotted is the median RMS for each coadd with colors indicating the filter: u (blue), g (green), r (red) and i (magenta).